Named like a horror movie but packaged like a rom-com, The Boy Downstairs is a sweet showcase of writer/director Sophie Brooks’ takes on memory, expectation and charm. 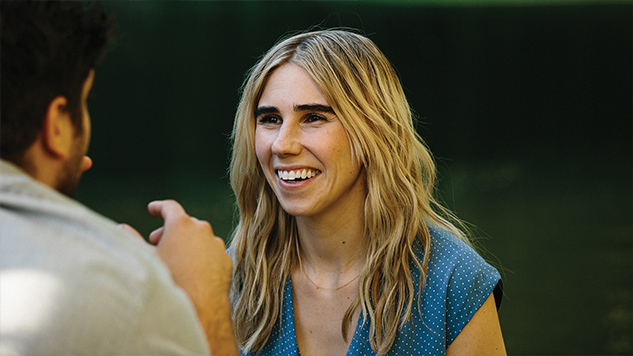 Her debut film, it sets a scene that would feel more familiar as a sitcom pilot: Zosia Mamet plays Diana, an artistically unfulfilled writer working at a wedding shop, as someone returning to New York City needing an apartment. The one she finds—unbeknownst to her—houses ex-boyfriend Ben (Matthew Shear) on its bottom floor. Mix girl and boy in sizable container, stir well with a complex interpersonal history and chill in the New York winter. The ingredients are familiar, but, like the not-quite-conventional ensemble comedy Girls, on which Mamet cut her chops, there’s an impressive amount of range and realism in the film’s humor and heartbreak, as well as in its lead actress. Mamet’s first film post-Girls constricts and slows its typically-frenetic genre to a more contemplative speed, slowly examining her face as she explains her way out of, or around, her emotions. Mamet excels at speedy delivery and making sweeping emotional statements through waves of Diana’s empty chatter. Her conversations—whether berating her real estate agent Meg (Sarah Ramos) or explaining to Amy (Deirdre O’Connell), her landlord/mentor, that of course she didn’t know Ben lived downstairs—always buzz on a different frequency from the pain or love on her face. Meg’s a small part, but Ramos gives every reaction shot her deadpan best, while Amy’s a complicated friend who’s more than a sounding board for boy troubles. Ben, while not a sharp character, is a pointedly defined fuzzy goofball, the kind of soft-hearted scruffy guy who may win you over bringing you home to mom. Filling in the gaps in Ben and Diana’s past relationship are certain triggers, like sights, smells, sounds or conversational topics—memories—which flash us back to their source. Tapping into this metaphysical narrative strategy, hopping between timelines like someone who’s just unknowingly brushed by an ex-lover in public, adds an un-intrusive depth to the struggle between the characters’ appearances and what’s happening inside them. While Diana in the present wrestles with her possibly-rekindling feelings for the now-unavailable Ben, their doomed past selves joke and swoon beautifully—these flashbacks the only wistfulness indulged by the filmmaking in hindsight. The film builds a stronger and stronger foundation as it moves forward, using flashbacks as blueprints to build increasingly complex emotional lives. Sometimes the post-breakup negotiations of the present emotionally underwhelm compared to the zip and bang of the fresh relationship the film keeps cutting back to, but the film rarely stagnates, as the characters either move things forward (teasing a reunion as much as snuffing out their flames yet again) or carry the momentum on their own merits. Boiled down to its base elements, The Boy Downstairs is Mamet’s show to run, and she runs it well aside a quiet romantic interest and sparse side characters. The faith Brooks puts in Mamet pays off, and together they craft a refreshing romantic comedy.